Peyote cactus in its natural state. Peyote (Lophophora williamsii) is a small, dome-shaped cactus whose native region extends from the southwestern United States through central Mexico. Its effects as a psychoactive agent may have been known for as many as 10,000 years. Proponents of its use see it as a method to stimulate psychic growth and to reveal what many partakers believe to be a spiritual reality. Although illegal in most jurisdictions, its use continues today, especially among indigenous peoples of its native regions who utilize it as part of their religious rites. Mescaline, the chemical derived from the cactus seed, and peyote in its natural form, are widely distributed hallucinogen agents, used by ardent truth-seekers and recreational "trippers" alike. Its value in the pursuit of spiritual enlightenment has been challenged in recent times by those who see it as a cheap means to experience a drug-induced altered state. Others view the use of peyote as a powerful but potentially harmful tool that can alter perception to reveal an alternative reality that can best explored through more natural methods. Peyote is a hardy plant; its natural growing range extends from the Rio Grande and western regions of Texas southward into Mexico's Chihuahuan Desert and Tamaulipan Thorn Forest. Peyote prefers a warm, temperate desert with fertile but sandy soil, although it is known to withstand much harsher conditions. The top of the cactus that grows above ground is referred to as the crown. The crown flowers sporadically and produces small pink fruit, that are sweet-tasting when eaten. The seeds, called "mescal buttons," are small and black, requiring hot and humid conditions to germinate. It is these "buttons" that produce hallucinogenic effects when ingested by humans. Peyote contains a large spectrum (at least 28) of phenethylamine alkaloids, the principal of which is mescaline. All Lophophora species are extremely slow growing, often requiring up to 30 years to reach the flowering stage in the wild. For this reason peyote is becoming scarce in its natural habitat, as it is unable to reproduce rapidly when harvested from the wild for human purposes. Dried Peyote buttons with American nickel for reference. Procuring peyote "buttons" or seeds can be difficult, and growing peyote for ritual use is a slow process. Still, devotees cultivate peyote in almost every part of the world today. It can thrive in greenhouses and grow rooms; in shade or full sun. Belonging to the family Cactaceae, it is considered a "low maintenance crop," requiring minimal effort in watering, pest control, and trimming, that other fruit crops typically demand. Cultivated specimens grow faster than wild plants, usually taking from six to ten years to mature from seedling to fruition. Domestic process is tedious, so most growers prefer to plant or graft the disc-shaped buttons that sprout from the crown of a mature plant. The top of the root will callous over, and new buttons will eventually grow. Harvesting techniques done improperly can damage the root and cause the plant to die. The same buttons used for the grafting process in peyote cultivation are used for human ingestion as a medicinal, transcendental, and recreational agent. These buttons are generally chewed or boiled in water to produce a psychoactive tea that is extremely bitter, often causes nausea before the onset of the psychedelic narcotic effect. The plant's resilient tenacity makes it a potent medicine. Researchers have attributed antibiotic and other medicinal qualities to the plant; religious users appreciate the natural mescaline, a powerful psychotropic alkaloid, which is the plant's main neuroactive ingredient. The effective dose for mescaline is 300 to 500 mg (equivalent to roughly five grams of dried peyote) with effects lasting up to 12 hours. Peyote is reported to trigger states of deep introspection and insight that have been described as being of a metaphysical or spiritual nature, at times accompanied by rich visual or auditory effects (see synesthesia). Some users experience seriously disturbing or psychotic episodes of mental distress. Scientific understanding of the possible psychological and spiritual damage suffered from use of peyote use is limited. Critics warn that safety can never truly be assured, and laws prohibit the harvest and use of peyote in most jurisdictions. Huichol and Aztec Indians engaged in ceremonial peyote ingestion for centuries before European explorers arrived in what is now called Mexico. In the late 1800s, peyote use spread north into the United States, as part of a revival of native spirituality when American Plains Indians brought their peyote rituals to the Great Basin and southern Canada. Peyote "churches," combining Christianity and peyotism, began to be known in the early 1900s as the Native American Church, which was officially formed in 1954. 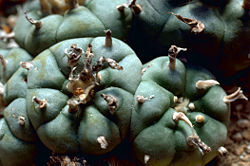 Members of the NAC refer to peyote as "the medicine" and have used it to combat alcoholism and other social ills. Between the 1880s and 1930s, U.S. authorities attempted to ban Native American religious rituals involving peyote. The Native American Church is one among several religious organizations that still use peyote as part of their religious practice. Another example are the Huichol Indians, whose estimated 20,000 members live in Mexico's Sierra Madre Occidental in the states of Nyarit and Zacatecas. The Huichols still practice traditional peyote pilgrimages to their sacred land of Wirikuta, a peyote-growing region near San Luis Potosi, where they gather cactus for use in ceremonies designed to ensure rain, food, and spiritual health. A surge of interest in the use of peyote spread in the 1970s and can be traced to the written accounts of its effects in the early works of writer Carlos Castaneda where he describes the Yaqui way of knowledge requiring the use of plants such as peyote. Don Juan Matus, the pseudonym for the author's mentor and guide in the use of peyote, used the name Mescalito to refer to an entity that purportedly can be sensed by those using peyote to gain insight into how to live one's life. Although no organized establishment is known to exist based on Castaneda's advocacy of peyote use, much of the hippie counterculture's experimentation with mescal was inspired by his writings. My perception of the world through the effects of those psychotropics had been so bizarre and impressive that I was forced to assume that such states were the only avenue to communicating and learning what Don Juan was attempting to teach me. That assumption was erroneous. Ever since the arrival of the first Europeans in the New World, peyote has provoked controversy, suppression, legal sanctions, and even persecution. It was condemned by the Spanish conquerors, as one example, for its "satanic trickery." Today, the opponents debate whether peyote use should be protected as a harmless religious rite, or banned as a dangerous drug which harms humans in both known cases and in ways they have not yet come to realize. Whether or not it is within the rights of indigenous groups to legally ingest this plant, it is feared that allowing their use of the plant serves to encourage its popularity among recreational users. Proponents argue that mescaline, which comes from the earth, is the safer, more natural alternative to LSD, the synthesized psychedelic drug that produces similar effects. The counter-argument states that psychotrophic substances are subject to misuse. While peyote is considered a controlled substance and therefore illegal to possess and sell generally, United States federal law (and many state laws) protect the harvest, possession and consumption (but not cultivation) of peyote as part of "bonafide religious ceremonies." The federal regulation is 42 USC §1996a, called the "Traditional Indian religious use of the peyote sacrament," which exempts only Native American use; while most state laws exempt any general "bonafide religious activity." American jurisdictions enacted these specific statutory exemptions in reaction to the U.S. Supreme Court's landmark decision in Employment Division v. Smith, 494 U.S. 872 (1990), which held that laws prohibiting the use of peyote do not violate the Free Exercise Clause of the First Amendment. Although many American jurisdictions specifically allow religious use of peyote, religious or therapeutic use not under the aegis of the Native American Church has often been targeted by local law enforcement agencies. Non-natives attempting to establish spiritual centers based on the consumption of peyote as a sacrament or as medicine, such as the Peyote Foundation in Arizona, have been prosecuted. Under the Canadian Controlled Drugs and Substances Act mescaline is defined as an illegal Schedule 2 drug, but peyote is specifically exempt. The Native Americans in Canada are able to take peyote if they have a full status card. Although peyote does not grow naturally in Canada, native tribes in Alberta and Saskatchewan had been importing peyote buttons from Arizona and other arid locales in the American Southwest and using them in peyote ceremonies, for at least a few hundred years. Some believe peyote has been imported into Canada for thousands of years. Federal officials were sympathetic to the peyotists' plea not to ban their sacred plant, and so decided to only ban the extracted active ingredient, mescaline. A State on whose territory there are plants growing wild which contain psychotropic substances from among those in Schedule I and which are traditionally used by certain small, clearly determined groups in magical or religious rites, may, at the time of signature, ratification or accession, make reservations concerning these plants, in respect of the provisions of article 7, except for the provisions relating to international trade. Coulter, John M. "Preliminary Revision of the North American Species of Cactus, Anhalonium, and Lophophora" U.S. National Herbarium, June 19, 1985. Curtis' Botanical Magazine "ECHINOCACTUS WILLIAMSII" 1894 lophophora.blogspot.com. The Vaults of Erowid Peyote. This page was last modified on 18 March 2019, at 21:21.